Expanse of the last hotel bed. Could be in warm months. Eyes glued on the falls and breath fogs. Their breath becomes part of The Falls. Moisture. Cloud. Snow flake. River. And she snaps her last photograph. Thank you so much for the fun comment. I really can’t wait for Niagara and Canada in the summer. 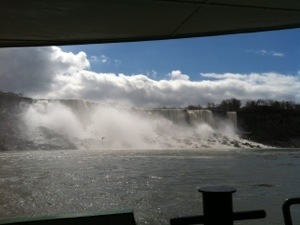 The beauty of the falls is amazing….